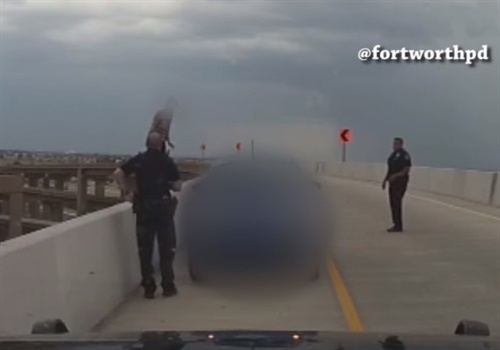 VIDEO: Texas Police Save Woman from Jumping off Freeway Overpass"
Officers Trae Cierzan and Justin Henry of the Fort Worth Police Department answered a call of a possible suicidal person on a very high highway bridge, and the entire incident was captured in dramatic video. According to the Star Telegram, the officers came to the scene to discover a distraught woman standing precariously atop the safety barrier. They officers slowly approached her as she said, "Please take care of my dog," and "Everybody wants me dead." "Nobody wants that," one of the officers said. "Please get down." "You don't want to do this," the other officer said. "You want to come talk to us." Then, in a flash, the two officers closed the remaining distance, grabbed the woman and brought her to safety. "We're going to get you some help, okay?" one of the officers says as the put the woman in handcuffs.